Having represented her country at the 100km World Championships in Croatia earlier this year, and winning the tough Sani Stagger Marathon this past weekend, physiotherapist and mother of three Lisa Collett continues to impress on the marathon stage. 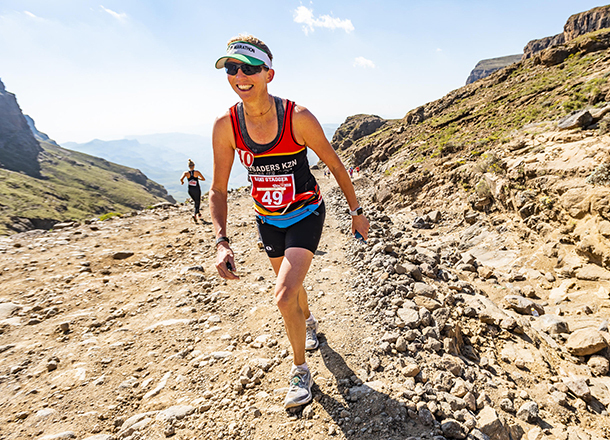 The 41 year-old from uMhlanga was in fine form at the iconic race up and down Sani Pass where she won the women’s race by 25 minutes over the defending champion. She was also coming off a demanding Bluff Marathon six days before but showed her class to win on her first Sani Stagger attempt. “I entered the Stagger right after Comrades when the World 100km Champs wasn’t on the cards for me,” Collett said. “After the World Champs I was feeling slow and heavy for a while and only really started feeling good again recently. Running has been in Collett’s blood for many years, however she was never a marathon runner until she decided to take on the London Marathon and completely surprised herself. From that point she realised that she had a talent for long distance running. “I was so fortunate to be given a London Marathon entry while I was living and working in England. Collett has now shifted her focus to the 2019 Comrades Marathon and being as well prepared as possible for the iconic ultra-marathon. She ran as well as she could in 2018 and had to settle for 14th overall, but is looking for an improvement in 2019’s up run. “I’ve finished 14th twice in a row, maybe it’s my lucky number!” she said with a chuckle. “I ran my perfect race this year at Comrades and I don’t think that I could have done any better but I will be hoping to break into the top 10 next year. Collett’s career has taken off recently and following her inclusion in the Elite Athlete Development Programme she will be taking a bit more care in how she goes about preparing for races. The mother of three continues to set an example for other women eager to maintain a balance between achieving top results as an elite athlete and raising a family. “I don’t see myself as a professional runner because I have a job,” she laughed. “Throughout my career I’ve just moved through the field and got better and then I found myself in the top three at races! “To be selected to be part of the EADP has been an incredible opportunity for me. With world class doctors and trainers available to her, Collett is hoping to take full advantage of the services that the EADP has on offer as she builds towards the Comrades Marathon in 2019. “Nutrition is vital to ultra-distance running and to be able to have the help of a dietician is another incredible addition that I am incredibly appreciative for,” the Boxer Running Club athlete added.